There are hundreds of eLearning blogs at the eLearning universe. The truth is that the most of them are waste of time. However, there are some eLearning blogs that worth to spend time and read remarkable eLearning articles. The most of you know that I am extremely passionate about eLearning. Every day I am reading several eLearning articles from various eLearning blogs. 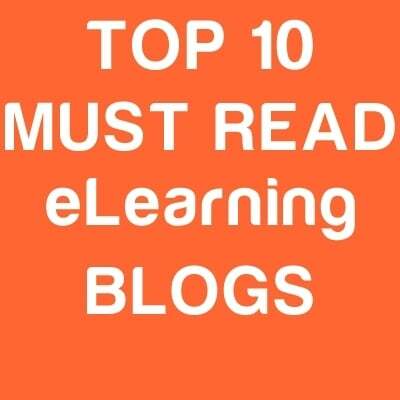 At this post, I would like to highlight my personal list of the Top 10 Must Read eLearning blogs. These eLearning Blogs run from independent eLearning bloggers that have a great passion about the eLearning field and want to share their eLearning knowledge and expertise. Provoking deeper Thinking, by Ryan Tracey, eLearning Manager. The e-Learning Provocateur is where Ryan shares his valuable 10+ corporate eLearning, as well as, higher education experience. Tips and reviews from success with online and mobile learning, by Connie Malamed, eLearning, information and visual designer. The eLearning Coach is where Connie shares actionable strategies, practical content, product reviews and resources to help you design, develop and understand online learning. The Truth and Realities of E-Learning, by Craig Weiss, E-Learning Blogger, Expert, Analyst, Speaker. Craig Weiss is an e-learning analyst, consultant and advisor whose firm E-Learning 24/7 provides services to buyers and suppliers in the e-learning industry. He writes the E-Learning 24/7 blog that is read in 133 countries. Let's Save The World from boring training! by Cathy Moore, International thought leader. On Cathy’s blog, you'll get ideas that will help you develop action-packed learning materials for working adults. By Jane Bozarth, eLearning and Instructional Design specialist. At Jane Bozarth's Bozarthzone, you will find ideas for creating and outsourcing inexpensive e-learning solutions, along with general thoughts about the training and development field. By Mayra Aixa Villar Instructional Designer and eLearning Consultant. If you want to find more about Instructional Design, Applied Linguistics (more specifically, Computer-based Language Learning) and Adult Pedagogy I highly encourage you to read Mayra’s Blog. Learning in the Social Workplace, by Jane Hart, Independent advisor on Workplace Learning & Collaboration. At Jane’s blog you will find how to support learning, performance and collaboration in the social workplace. A diary of sorts about what I'm learning about Learning, by Matthew Guyan, Learning and Development Officer. At his blog I have found extremely interesting article about eLearning, instructional design, gamification, MOOC, and online facilitation. Eric's Ramblings, experience and random thoughts about e-Learning, Distance Education and Educational Technology, by Eric A. Tremblay, M.Ed., C.I.D., Educational Developer. Eric’s blog is extremely valuable for eLearning professionals interested in higher education eLearning. eLearning, mLearning, Blackboard, Blogging, Social Media, and the stuff in between / David Hopkins, by David Hopkins, Learning Technologist. At Technology Enhanced Learning Blog, David shares his experience of the uses of technology in Higher Education. Are You a Top e-Learning Blog owner?